Luxepolis Retail Services Pvt Ltd, which runs an online marketplace for new and pre-owned luxury products, plans to raise Rs 6.6 crore (around $1 million) as seed fund from a Mumbai-based institutional investor by the end of this month. The Mumbai-based company which sells apparel, fashion accessories, watches and jewellery from premium brands, as well as luxury automobiles, will be utilising the fund to expand its product categories. Luxepolis founder Vijay KG said that the investor, which is also a LP in a venture capital firm, is expected to invest another Rs 6.6 crore to back the startup's expansion strategy for Delhi, Bangalore, Chennai, Hyderabad and Kolkata. "We are going to add branded furniture, electronics and kids fashion to our existing portfolio. We are expanding our inventory to over 10,000 SKUs in the next three months," said Vijay. An alumnus of Motilal Nehru National Institute of Technology, Vijay launched Luxepolis.com in July this year. He had earlier served online beauty and cosmetics marketplace Nykaa.com. Prior to that, he had worked in Microsoft and Infosys. The company claims to have over 5,000 SKUs of vintage and new luxury products from top global brands such as Louis Vuitton, Hermes, Fendi, Chanel, Christian Dior, Gucci, Furla, DKNY, Michael Kors, Burberry, Coach and others. As for luxury automobiles, LuxÃ©polis.com offers new and pre-owned Maserati, BMW, Mercedes Benz and Audi cars. "We are getting orders worth Rs 15,000 per transaction on average. This is set to go up as we are currently giving 70 per cent discount on most products," he said, adding that a sizeable number of clients are from tier 2 cities. The company identified online premium products retailer Elitify.com as its main competitor. Darvey's is another player in this niche segment which claims to be a marketplace where luxury boutiques sell their products at the same price at which they sell in New York, London or Milan. These luxury product portals are increasingly becoming popular as they also have a cash-on-delivery model which is a big advantage for those who may not like to leave a paper trail for big-ticket transactions. 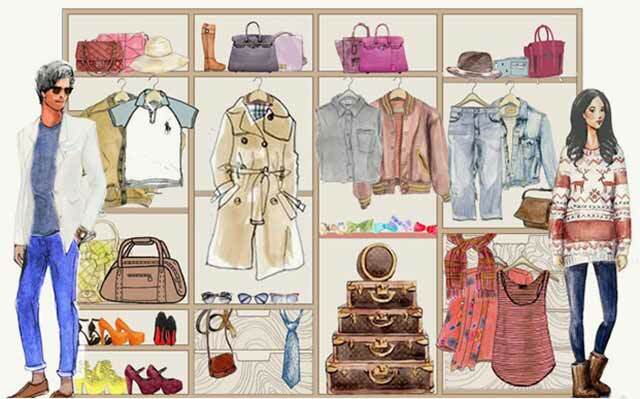 In August, Mumbai-based Armoire Lifestyle Pvt Ltd, which runs Envoged.com, an online platform for women's luxury wear, raised an undisclosed amount in seed funding from Nijhawan Group's Ankush Nijhawan, Mediology Software director Manish Dhingra and AMG Investment's Gaurav Bhatnagar. Bangalore-based Zapyle.com, which also lets users buy and sell pre-owned premium and luxury fashion brands on the platform, had recently raised $1 million from angel investors. Elanic, Stylish Play, Share Wardrobe and Etashee are among the other portals for pre-owned apparel in India. In addition, startups such as FlyRobe, Klozee and LibeRent rent out premium fashion apparel to users. Many of these ventures are trying to replicate the success enjoyed by international players such as Poshmark, Secoo and Glambot. Luxepolis Retail Services Pvt. Ltd.